This elegant 1800 square foot duplex home is the lower level of our duplex. The home is beautifully furnished and decorated featuring three bedrooms, each with a king size bed and private bathroom, a queen size sofa sleeper and an inflatable twin size air mattress. Two of the bedrooms have gas burning fireplaces, kitchenettes and private balconies. There's also a pool table, HD satellite TV, wifi internet, an Ipod stereo docking station, a wet bar and a wood burning fireplace. Adjoining the living room is your dining area and fully equipped kitchen. French doors open up to a large covered deck with a barbecue and patio seating. "Lower Enchanted Forest" is truly one of our finest accommodations and can be rented either by itself or in conjunction with "Upper Enchanted Forest" sleeping an additional eight persons for an even larger group or family gathering. Upper Enchanted Forest is a very spacious and comfortable 2000 sq. ft. duplex home. This second story accommodation offers the finest in furnishings and features three bedrooms each with a king bed and private bathroom. There is a queen size sofa bed in the living room and even a twin size inflatable air mattress if you need to sleep an extra person. Two of the bedrooms have gas fireplaces, kitchenettes and their own private outdoor decks. The over sized living room has been designed for entertaining, complete with a 42" plasma screen satellite HD TV with 200 channels, DVD/Blu Ray video players, an Ipod Stereo docking station, pool table, wet bar and is highlighted by a three sided river rock gas fireplace. Adjoining the living area is your indoor hot tub that comfortably seats eight. This room has large glass windows capturing a beautiful view of the trees. A commercial-grade kitchen with a Wolf brand gas range with grill. Two Sub Zero brand, double-door refrigerators, two trash compactors, two dishwashers. The dining room table seats 12 and the counter has an additional 4 bar stools. "Half Dome Retreat" has all the amenities necessary to make your stay in Yosemite National Park enjoyable. The studio condo comfortably sleeps up to 4 guests with a queen size bed and a queen size sofa sleeper. It has one full bathroom with a shower/tub, a fully equipped kitchen, gas fireplace, Wifi Internet, satellite television and a DVD player. You will have your own private deck with an electric grill and outdoor seating. This perfect little condo is ideal for a small family, close friends, or a romantic getaway for two! You will experience the best lodging value in Yosemite National Park! REMODELED IN APRIL 2017 with new furniture, flooring, stone counter tops, appliances and drapes! 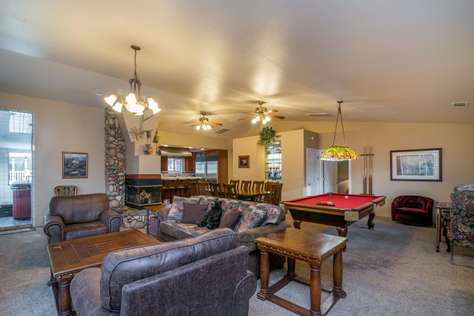 This cozy mountain condo has all the amenities necessary to make your stay in Yosemite National Park enjoyable. Complete with a satellite 42" flat screen television, DVD video player, Wifi Internet, family games and DVD's, a gas fireplace and a small, yet fully equipped kitchen. It has a queen size bed, a queen size sofa sleeper and one full bathroom with a shower-tub. This perfect little condo is ideal for a small family, close friends, or a romantic getaway for two! 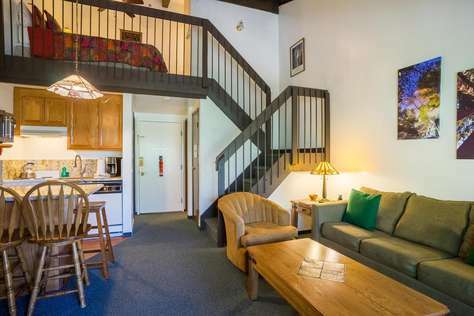 This simple little mountain condo has all the amenities necessary to make your stay in Yosemite National Park enjoyable. Complete with satellite television, Wifi Internet, DVD video player, family games & DVD's, a gas fireplace and a small, yet fully equipped kitchen. You'll have a queen size bed Murphy bed, a queen size sofa sleeper and one full bathroom with a shower/tub. The studio is an end unit with a large window that faces the forest in addition to the sliding glass door which opens to your deck with a table and chairs and electric grill. This perfect little condo is ideal for a small family, close friends, or a romantic getaway for two! "Woodland Treasures" has all the amenities necessary to make your stay in Yosemite National Park enjoyable. Complete with satellite television, DVD player, Wifi Internet, family games and DVD's, a gas fireplace and a fully equipped kitchen. Recently renovated with beautiful new flooring and furnishings. There is an open loft with 1 queen bed, a twin size bed and a pull out queen sofa bed sits in the living room. There are two bathrooms, one on each level. You also have your own private balcony facing the hillside with an electric grill and seating. This sweet little mountain condo has all the amenities necessary to make your stay in Yosemite National Park enjoyable. Complete with a satellite 40" flat screen television, Wifi Internet, DVD video player, family games & DVD's, a free standing gas fireplace and a small, yet fully equipped kitchen. You'll have a queen size bed with a pillow-top mattress, a queen size sofa sleeper and one full bathroom with a shower/tub. The studio is an end unit with a large window that faces the forest in addition to the sliding glass door which opens to your deck with an electric grill, table and chairs. This perfect little condo is ideal for a small family, close friends, or a romantic getaway for two! This darling little mountain condo has all the amenities necessary to make your stay in Yosemite National Park enjoyable. Complete with a satellite television, DVD video player, Wifi Internet, family games & DVD's, a gas fireplace and a small, yet fully equipped kitchen. You'll have a queen size bed, a queen size sofa sleeper and one full bathroom with a shower/tub. The deck has an electric grill, table and chairs. This perfect little condo is ideal for a small family, close friends, or a romantic getaway for two! 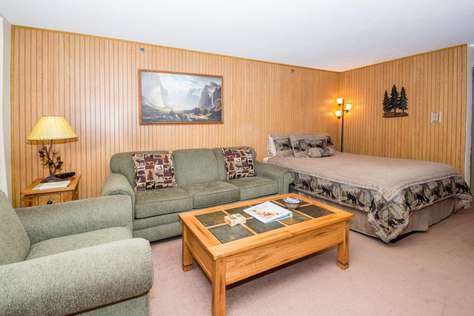 "Foxes Lair" has all the amenities necessary to make your stay in Yosemite National Park enjoyable. Just remodeled with all new kitchen appliances, granite counter tops, cupboards, paint, carpeting and drapes. Complete with a satellite 36" flat screen television, DVD video player, Wifi Internet, family games and DVD's, a gas fireplace, and a small, yet fully equipped kitchen. You'll have a queen size Murphy bed that pulls down from the wall, a queen size sofa bed and one full bathroom with a shower-tub. There is a beautiful hillside view from your deck with an electric grill and seating. This perfect little condo is ideal for a small family, close friends, or a romantic getaway for two! "Badgers Loft" is a very comfortable and spacious studio with a loft. The loft has a vaulted ceiling with 2 queen beds and a pull out queen sofa bed sits in the living room. There are two bathrooms, one on each level, satellite television and a DVD/Blu ray video player. You also have a balcony with an electric grill and seating, Wifi Internet, family games and DVD's, a gas fireplace and a fully equipped kitchen. 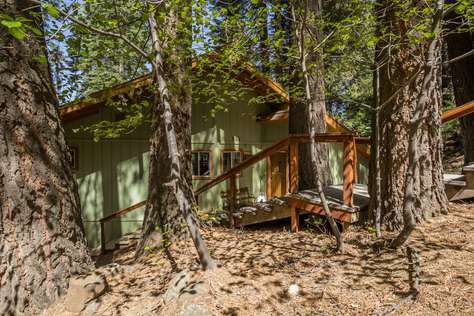 This cozy mountain condo has all the amenities necessary to make your stay in Yosemite National Park enjoyable. Complete with satellite television, a DVD video player, Wifi Internet,family games and DVD's, a gas fireplace, a fully equipped kitchen and a balcony with seating and an electric grill. There is an open loft with 2 queen beds and a pull out queen sofa bed sits in the living room and two bathrooms, one on each level. 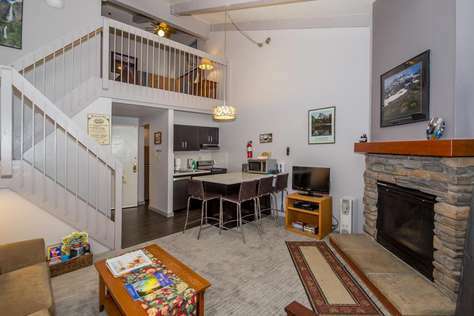 Condo #B206 is a studio with a loft and has HD satellite television, a DVD/Blu ray video player, Wifi Internet, family games and DVD's, a gas fireplace, kitchen and private balcony with an electric grill and seating. There is an open loft with 2 queen beds and a pull out queen sofa bed sits in the living room and two bathrooms, one on each level. This charming studio condo sleeps 2-6 people and has all the comforts necessary to make your stay in Yosemite National Park enjoyable. The living room features a gas fireplace, satellite television, a DVD player, Wifi Internet, family games and DVD's and a pull-out queen sofa sleeper. The kitchen is fully equipped with a stove-top oven, microwave, dishwasher, refrigerator, coffee maker, toaster and cooking utensils. There are 2 bathrooms, one on each level. Upstairs in the open loft is your full size bed and bunk beds with 2 twins. There is a beautiful hillside view from your deck with an electric grill and seating. 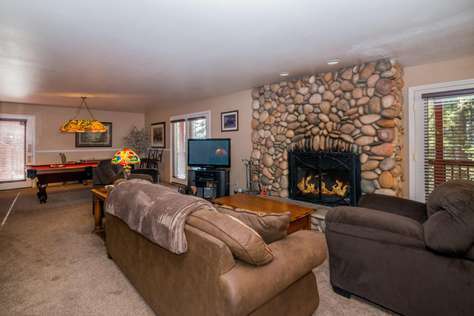 Come experience true mountain comfort in our newest addition of vacation rentals. This quaint little 3 bedroom house is ideal for families. There are 3 bedrooms plus a loft with a queen size sofa sleeper. The living room has a gas fireplace and HD satellite TV with a Blu-ray/DVD player and an incredible window view of the woods along with a spacious deck perfect for your relaxation. On the lower deck you can enjoy your hot tub or retreat to "Cub's Den", the entertainment room. This lower portion of the house is equipped with workout equipment, a bar, lounge, Air Hockey table and a full bathroom.